The cruise only package we book ie: not taking the add on&apos;s from AMAWATERWAYS as in pre and post cruise . However we had booked online direct with both the Sofitel hotels for 2 days prior and post cruise and still coming out more cost effective than the add on prices. The pre cruise set up was perfect and cruise manager Thaui was excellent from the first minute we met. Effortless pre cruise info ( bags out in hallway of hotel re identify and load all sorted by staffing) The 6 hour transfer with two one hour stops did fly by with good enroute info and stops and markets to turn ones stomach all part of the experience. The " we are all family " Ama Waterways concept works well . From the start of the transfer to the end of day 5 each group had its Cambodian guide our blue group guide was Tek Leng who was exceptional. Due to a issue in the dinning room the welcome on board drinks and first night dinner was a bit all over the show as the "the paint had not dried" but Markus the Cruise director was in control in perfect Austrian style. All tours and excursions being included in your price made life a lot easier as the selection of tours is well and truly thought through and tailor made to a variety of abilities . However this cruise is not for people who cannot rise above a level 2 in walking and exertion. 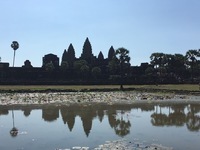 My 2 stand out excursions of the 14 we did was the Ox cart ride and Buddhist monastery visit and blessing along with the oknhatey school visit in Cambodia. The meals on board where fantastic , only issue was that a Hamburger is more meatloaf or frikadel than beef burger :-)) however the traditional foods and service in the Mekong Restaurant was outstanding and a shout out to our waiters, Dara and Venestra . We did do the chefs table restaurant which is situated aft on the ship with great views and furnishings. However our table of 8 all felt we were slightly rushed and limitations on the wines ( which never altered by meal course, which is the norm) Service was not up to the levels in the main restaurant . The Bar service with a smile and enthusiasm and happiness from Det and Soheap where contagious in a good way. We where very lucky to have the Vice President Kristin Karst on board as she said she only visits once a year. A fantastic lady who made the effort everyday and night to interact in both excursions and meals and entertainment. Of course surrounded by yes men who clearly looked out of place amongst the crew. The overall entertainment and humour took a dive on board hence my very low score in this area. On day 4 Markus the Cruise director and glue to the Amwaterway family was rushed to hospital with suspected dengue fever and thus never completed the cruise . However we did have Thaui who stepped up and tried his best . The other downside was the influx of 18 UK travel agents for the last 3 days who where kept in a separate group for excursions but half of them clearly never fitted into the dynamic that had been created amongst the 90 paying passengers. This was defiantly a once in a lifetime destination, however as I said to Kritin Karst if they got the Amazon and Myanmar programmes sorted out we will definitely book with them again for those . The AmaDara is a lovely well structured ,planned , crewed and managed ship one not to miss. The cruise only package we book ie: not taking the add on&apos;s from AMAWATERWAYS as in pre and post cruise . However we had booked online direct with both the Sofitel hotels for 2 days prior and post cruise and still coming out more cost effective than the add on prices. The pre cruise set up was perfect and cruise manager Thaui was excellent from the first minute we met. Effortless pre cruise info ( bags out in hallway of hotel re identify and load all sorted by staffing) The 6 hour transfer with two one hour stops did fly by with good enroute info and stops and markets to turn ones stomach all part of the experience. The " we are all family " Ama Waterways concept works well . From the start of the transfer to the end of day 5 each group had its Cambodian guide our blue group guide was Tek Leng who was exceptional. Due to a issue in the dinning room the welcome on board drinks and first night dinner was a bit all over the show as the "the paint had not dried" but Markus the Cruise director was in control in perfect Austrian style. All tours and excursions being included in your price made life a lot easier as the selection of tours is well and truly thought through and tailor made to a variety of abilities . However this cruise is not for people who cannot rise above a level 2 in walking and exertion. My 2 stand out excursions of the 14 we did was the Ox cart ride and Buddhist monastery visit and blessing along with the oknhatey school visit in Cambodia. The meals on board where fantastic , only issue was that a Hamburger is more meatloaf or frikadel than beef burger :-)) however the traditional foods and service in the Mekong Restaurant was outstanding and a shout out to our waiters, Dara and Venestra . We did do the chefs table restaurant which is situated aft on the ship with great views and furnishings. However our table of 8 all felt we were slightly rushed and limitations on the wines ( which never altered by meal course, which is the norm) Service was not up to the levels in the main restaurant . The Bar service with a smile and enthusiasm and happiness from Det and Soheap where contagious in a good way. We where very lucky to have the Vice President Kristin Karst on board as she said she only visits once a year. A fantastic lady who made the effort everyday and night to interact in both excursions and meals and entertainment. Of course surrounded by yes men who clearly looked out of place amongst the crew. The overall entertainment and humour took a dive on board hence my very low score in this area. On day 4 Markus the Cruise director and glue to the Amwaterway family was rushed to hospital with suspected dengue fever and thus never completed the cruise . However we did have Thaui who stepped up and tried his best . The other downside was the influx of 18 UK travel agents for the last 3 days who where kept in a separate group for excursions but half of them clearly never fitted into the dynamic that had been created amongst the 90 paying passengers. This was defiantly a once in a lifetime destination, however as I said to Kritin Karst if they got the Amazon and Myanmar programmes sorted out we will definitely book with them again for those . The AmaDara is a lovely well structured ,planned , crewed and managed ship one not to miss. Our cabin 221 was well positioned mid ship first after the central staircase . Well insulated , excellent size at 251s sq ft with a queen size bed and separate seating are with two balconies and outside balcony with table and chairs and a French balcony . no issues with systems plugs etc all proved and cabin well maintained . Excellent accommodation. all day cruising with border /passport control taking up 3 hours of the day.